What Can Professional Packers Do for You? August 14th, 2012 | Packing Tips. Should you conduct packing yourself? On the surface it seems like a no-brainer. With a little extra work, you can box your things up for pennies on the dollar. Let’s look at some of what some of that extra work is and how Bekins can save you from days or possibly weeks of frustration. Packing – Everyone has packed something at some point in their lives, but many of them often forget just how much space their things take up. Can you accurately estimate how many boxes you will need? How much will those boxes cost? What about all of the tape and packing paper? How do you pack a mattress or a full-length mirror? If you’ve ever moved a college-bound child into a dorm room, you will know that just a bedroom’s-worth of items can easily fill a minivan. On top of the multiple rooms in your house, you also have to start digging into closets, cupboards, and whatever spaces you may have actually forgotten had items in them (Remember the attic?). After your third or forth trip to the store for supplies, the costs start to add up and the work even moreso. Suddenly packing yourself is not seeming as easy as it used to. Why not make packing day as hard as finishing that glass of wine while pointing the movers to your things? When you are receiving your free estimate from a Bekins agent, an inventory of all your items is meticulously made. This list is then used to accurately estimate the number and types of boxes needed for your move. Would you be surprised to learn that there are special boxes specifically for that mattress and mirror? These boxes are reinforced and far more durable than the boxes you would think to look for. 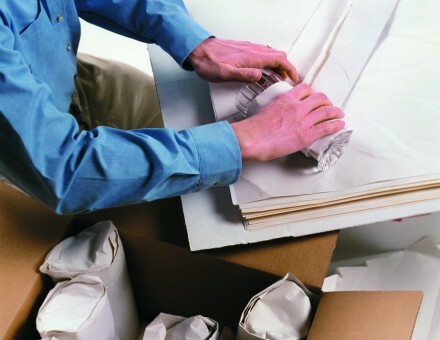 Combine the packers’ foresight and knowledge to bring the proper materials with the skill to quickly and securely pack your things, and packing becomes a breeze! What if I want to have my items packed and I decide to move 6 months later? Can this be done? Hi Robert! It is possible to have your items packed six months prior to moving. Contact your local Bekins agent for more information.